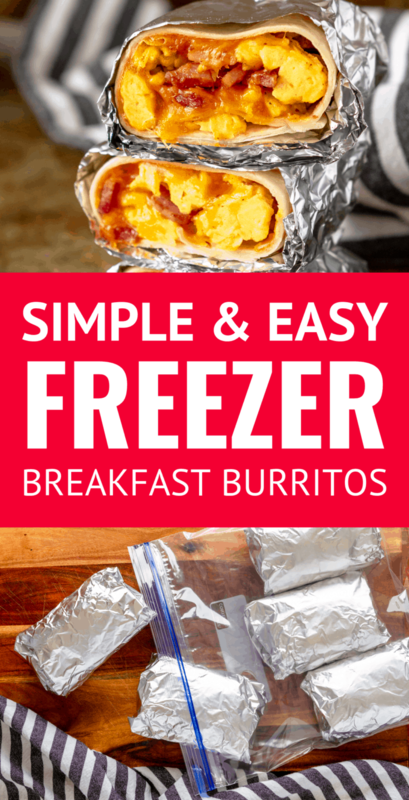 Skipping breakfast will be a thing of the past with these simple and easy ham, egg & cheese freezer breakfast burritos… Make ahead frozen breakfast burritos are the perfect way to meal prep breakfasts for the week! There are FAR too many days when breakfast looks like a cup of butter coffee that I’m slurping while trying to shoo all of my kids out the door for school. And inevitably, what seems like merely an hour later, I glance at the clock and realize it’s nearly 1:30pm (almost time for them to get home!) — and I’m absolutely ravenous. You too? Well, I’m aiming to solve this problem over my next few posts with some simple meal prep breakfasts, starting with these freezer breakfast burritos. Together, let’s make breakfast skipping a thing of the past! And they have to taste good! 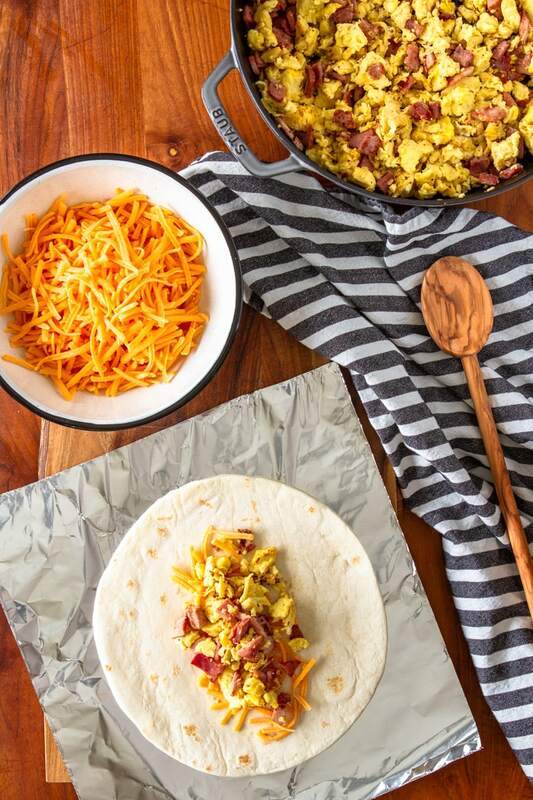 These make ahead breakfast burritos check off every box on my list. The ingredient list is super short (just 4 ingredients plus a bit of milk and butter), the prep time is fairly minimal, and they’re delicious when reheated! 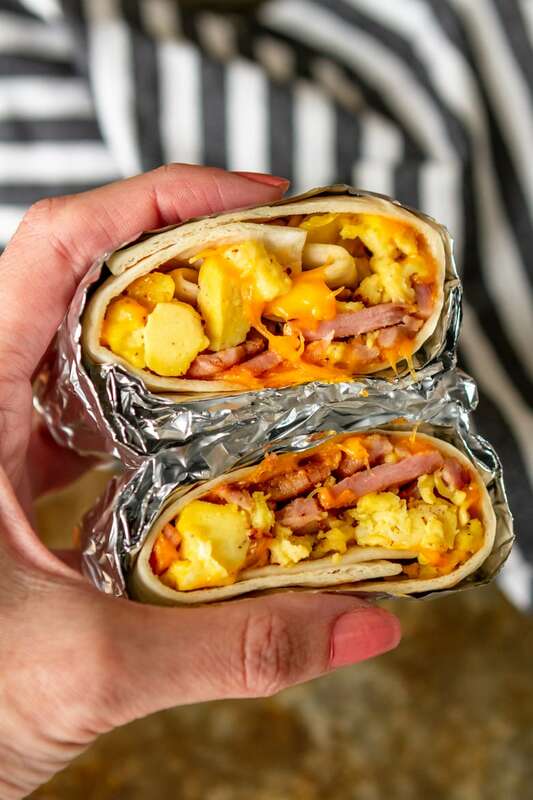 I attribute the amazing flavor to the Hillshire Farm® Premium Carved Slow Roasted Seasoned Ham that I used in these freezer breakfast burritos. This new premium deli meat is truly like buying from a butcher or carving from a baked rotisserie item — except you can just grab it from the packaged lunch meat section in Walmart and be on your way! Or in my case, I used Walmart Online Grocery Pickup to place the order for the ingredients for these easy breakfast burritos, which saves me a TON of time and headaches… My husband truly HATES shopping with me, because I almost always end up backtracking 2-3 times to pick up items I forgot. OOPS!!! So yeah, OGP is a total sanity saver for me. As I mentioned, I kept this easy breakfast burrito recipe super simple — just scrambled eggs, cheddar cheese, and the Hillshire Farm Premium Carved Slow Roasted Seasoned Ham, all wrapped in a flour tortilla. But even with the minimal ingredient list, these freezer breakfast burritos pack a ton of flavor. 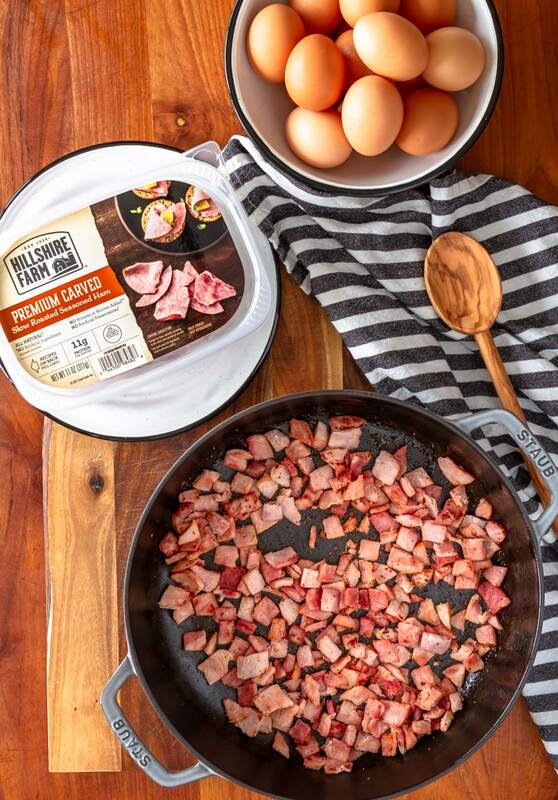 Making them is as simple as preparing a batch of scrambled eggs on the stovetop, pan-frying the ham to give it a bit of caramelization, and then assembling the breakfast burritos. How’s that for easy prep?! 1| Tortillas vary widely in size. I recommend using flour tortillas in the 10-12″ range to prevent the burritos from falling apart while you’re eating them. 2| Don’t overcook the eggs. Just scramble the eggs until they’re mostly set but not completely cooked through. No one likes rubbery reheated eggs! 3| Don’t skip pan-frying the ham. It adds such a tasty boost of yumminess! Is that even a word, LOL? 4| Allow both the eggs and the ham to cool before assembling the breakfast burritos. This prevents the tortillas from becoming soggy. 5| Wrap the breakfast burritos in aluminum foil and freeze in one layer on a baking sheet. When they’re completely frozen, you can transfer them to a zip-top freezer bag. Reheating freezer breakfast burritos can be done one of two ways: in the microwave or in the oven. Obviously, reheating them in the microwave is the quickest and easiest way. Just remove the aluminum foil, place them on a plate, and microwave for 4-6 minutes or until heated through, turning once. I haven’t owned a working microwave in years, so I place a still-wrapped frozen breakfast burrito on a quarter-sheet pan in my countertop oven and bake at 400 degrees Fahrenheit for about 25 minutes. If I remember to pop it in as soon as I wake up, the timing is just right for me to sit down to a hot and fresh breakfast burrito after getting my four oldest kids out the door! That’s it! One 30-minute meal prep session to make this easy breakfast burrito recipe should yield 12 frozen breakfast burritos, which lasts me quite a while since I’m rotating them with some of the other breakfast meal prep ideas I’ll be sharing soon. By the way, my favorite way to eat them is topped with lots of restaurant-style fresh salsa from the refrigerated produce section! PIN IT NOW! 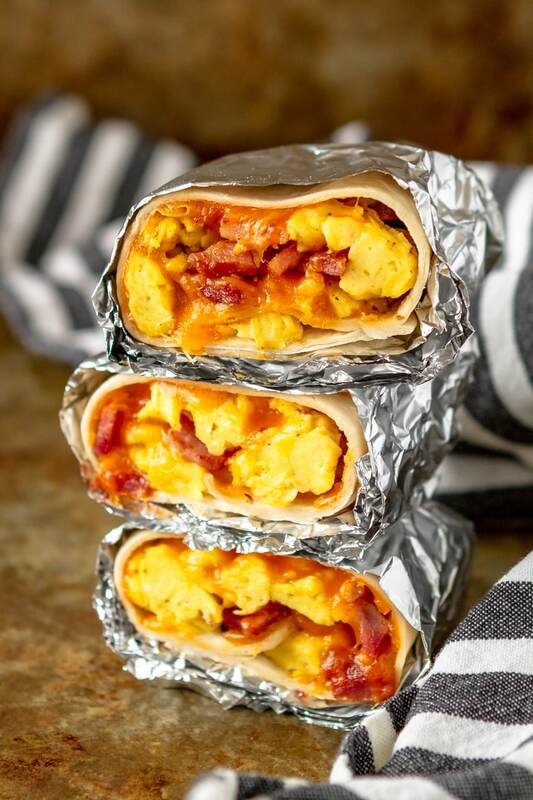 CLICK HERE TO ADD THIS FREEZER BREAKFAST BURRITOS RECIPE TO YOUR MEAL PREP RECIPES BOARD ON PINTEREST! 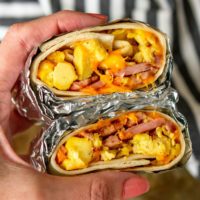 Skipping breakfast will be a thing of the past with these simple and easy ham, egg & cheese freezer breakfast burritos... Make ahead frozen breakfast burritos are the perfect way to meal prep breakfasts for the week! Pan-fry ham until browned. Set aside to cool. In a large mixing bowl, whisk together eggs, milk, salt, and pepper. Add the butter to a large skillet set over medium-low heat. Pour the egg mixture into the skillet and cook, stirring occasionally, until almost set. Set aside to cool, then fold in the browned ham. Tear off 12 squares of aluminum foil. Place a tortilla on top of one piece of foil. Sprinkle 2 tablespoons of cheese on top, and then top with 1/2 cup of the ham and scrambled eggs mixture. Roll the burrito by folding the sides in and then rolling tightly from the bottom up. Wrap the burrito snugly in aluminum foil, and repeat the process of filling, rolling, and wrapping the remaining burritos. Freeze the burritos in a single layer on a baking sheet. Then transfer them to a gallon sized zip-top freezer bag. Unwrap and place the burrito on a plate. Microwave for 4-6 minutes or until heated through, turning once. Or place a still-wrapped frozen breakfast burrito on a sheet pan, and bake at 425 degrees Fahrenheit for about 25 minutes. 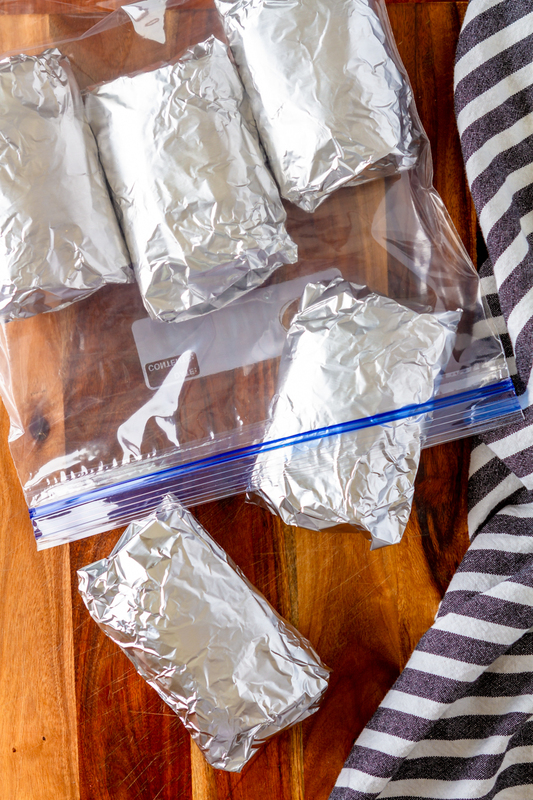 Storage: Frozen burritos can be stored in the freezer for up to 3 months. P.S. Find Hillshire Farm Premium Carved Meats with the packaged lunch meat in the perimeter coolers at Walmart. In addition to the Slow Roasted Seasoned Ham, you can also find Oven Roasted Turkey Breast and Rotisserie Seasoned Chicken Breast. These would also be delicious in this easy breakfast burrito recipe! P.P.S. If you want to give Walmart Online Grocery Pickup a try, use this link to receive $10 toward your first order!!! I’d love to see how your freezer breakfast burritos turn out… Tag me @Unsophisticook on Instagram or use the hashtag #Unsophisticook so I can check it out. Enjoy! Previous Post: « Try This Entertaining Hack For An Easy Charcuterie Board! I love how easy these burritos are to make! Perfect for a quick breakfast. Such an easy and delicious breakfast idea! I can’t wait to try it! These burritos look so delicious and are perfect for busy days! OMG! Why have I never thought to do this! What a great idea. Definitely need to make these for a busy morning! YES please! Anything to make life easier, and so yummy! Love the idea of freezing and making life so simple everyday for Breakfast. These parcels of health and nutrition is so easy to carry too. Looks yummy and perfect. These burritos are so delicious and I absolutely love having a stash of these in the freezer ready to go. Our mornings are hectic, so this takes the stress out of making breakfast. We just grab and go, then warm it up at work! Make ahead breakfasts are such a life savor at our house. Thanks for a great recipe. It was great to switch up some of our routine meals. These are really yummy. But, being from New Mexico I had to add a little onion and some Hatch Green Chile to really make them worthwhile. How can anyone eat a burrito without green chile in it. ?